Saturday is Oldie Goldies Day, and today we have four great country-pop icons of the 1960s — Johnny Cash, Carl Perkins, Roy Orbison, and Jerry Lee Lewis — in a tribute to Elvis. Into your hands, O Lord, Jesus Christ, my God, I commend my spirit. Bless me, save me and grant unto me everlasting life. Eve Tempted by the Serpent, John Roddam Spencer-Stanhope ca. 1890. The mille-fleurs background, and the faces and expressions, show the influence of the English pre-Raphaelites. Eve picks an orange here, perhaps a comment on the very wealthy who would keep orange trees in hothouses. Six analogies in six verses! Israel was a theocracy. Its religious sects thus combined aspects of political parties with theology. The theologies of the Pharisees and Sadducees, the two leading sects, were radically different, but both had substituted form for meaning; as inevitably occurs when politics becomes involved, the appearance of uprightness had become more important in their lives than true faith in God. To the Jews, the viper was the symbol of cunning and manipulative rhetoric, combined with venomous death; it was a viper who convinced Eve to eat the apple. One pictures a wildfire sweeping across the grassy plain, a common occurrence in Palestine, for such fire drives before it a horde of snakes (and other animals). When John sees these hypocrites coming to be baptized, he has mixed emotions. His diatribe is not a rejection of their repentance, for Christ's salvation will be available to all. It is, rather, a warning that their hypocrisy will not serve them any longer. He sounds angry, because he worries that they are up to their old tricks: repentance on their lips without any change in their hearts. The metaphors of the tree and the stones constitutes an attack on their self-righteousness. As the blood descendants of Abraham and heirs of the first covenant, or as branches of the tree of Jesse, they have become proud and self-righteous. They have turned the special relationship between God and the Hebrews into a closed, hidebound institution based on empty legalism; and they believe they have been permanently anointed to holiness by right of birth. 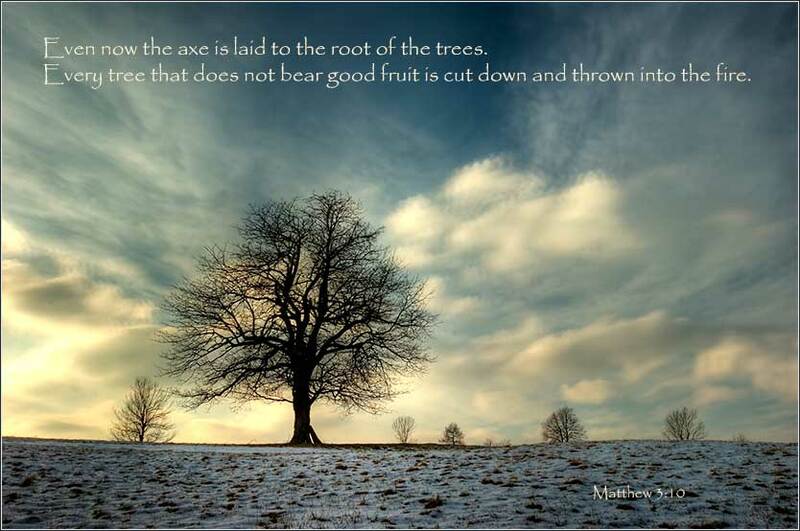 John pointedly references the Tree of Jesse, then, when he says that a tree that does not bear good fruit will be put to the axe. The baptism by the Holy Spirit and fire sounds frightening. Written in Hebrew, the two are more connected than in English, for the Hebrew word for “spirit” is also the word for “breath” and “wind”. Thus John draws an image of God's breath blowing on a prairie fire, fanning it into a holocaust. But we must also remember that fire is a great blessing; it provides light in the darkness, and warmth in the cold. Most importantly, fire can purify. John is warning the listeners, then, that the baptism of the Holy Spirit will purify the world, by destroying the hypocrites as chaff is burned, but preserving those who come in sincerity. People sometimes associate the idea of fiery hell with the Old Testament. In general terms, we think of the Old Testament, with all of its capital crimes, as the covenant of a stern God, and the New Testament as a celebration of love and gentleness. But the truth is the opposite. The image of hell as a pit of unquenchable fire is primarily a New Testament analogy, made several times by Christ himself. After the introductory matters of Chapters 1 and 2, Matthew's first theological statement is pure fire and brimstone, worthy of the most radical Puritan. This, then, is the starting point of Matthew's theology: repent in sincerity, for Christ's judgment will condemn the unrepentant sinner to a fiery hell.